These natural aqua blue kyanite clusters are MAGICAL and gorgeous. Blue kyanite is generally a stone that I can’t keep in stock because of the high demand, and finding pieces of this size and quality is a rare occurrence. The glimmering, silvery blue spears that comprise these gemmy chunks are aluminum silicate, a mineral of the triclinic crystal system. Kyanite is an energy worker and transmitter, amplifying high vibrations, filling spaces with positivity, and facilitating instantaneous alignment of the chakras. It’s wonderful for all kinds of work: meditation, space holding, energy clearing, and even healing. I carry blue kyanite with me to stressful meetings or family events to keep me grounded and in present time. This stone is one of my top 5 “can’t be without it” gems. Working with these natural aqua blue kyanite clusters Blue kyanite brings overall cellular alignment and balance, and draws you inward toward your core. It strengthens your will and vision so you move in concert with the Highest Good. It’s the stone of finding your sacred center. It is the ONLY stone known to instantly and evenly align all seven chakra points, and this brings you into fully centered presence. Wear it, hold it in meditation, place it on any chakra during energy healing (especially your throat), or carry it with you. It’s a major Throat Chakra healer, so if you are someone who struggles to express yourself or communicate openly, work with this stone to clear and align that Throat Chakra. Self truth is also governed by this chakra, so alignment and healing of Vishuddha energy greatly impacts your ability to be honest with your innermost self. This in turn flows outwards to your interactions with those around you. 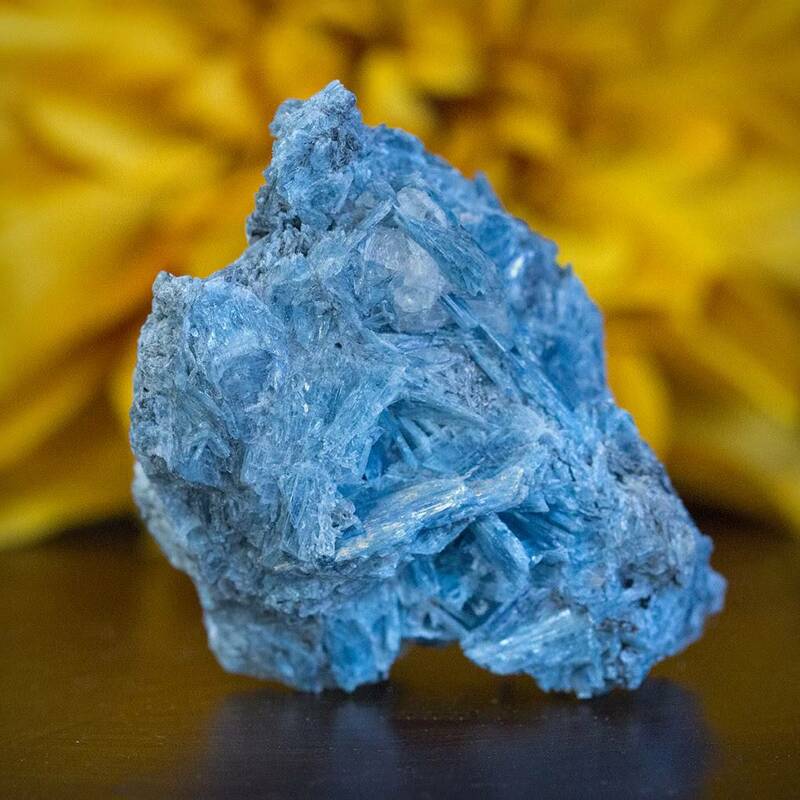 This listing is for one (1) natural aqua blue kyanite cluster 3-4″, which will come lovingly parceled, with a white sage leaf that you can use to clear energies. You will also receive a card describing the properties of this stone.